After centering her clay on the wheel, potter Joyce Maurus-Sullivan begins to form it into a bowl-shaped bean pot. 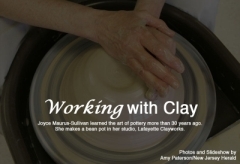 Maurus-Sullivan started Lafayette Clayworks, now located in Branchville, 19 years ago and spends her time creating pottery and teaching classes. BRANCHVILLE -- Potter Joyce Maurus-Sullivan compares her craft to playing a musical instrument. While you can learn the basics of working with clay after a handful of lessons, it's an intense learning experience that continues throughout your life. "The more you learn in pottery, the more it seems you don't know. There's always new things to try," she said, pointing out some of her most recent pottery experiments, from a ceramic citrus juicer to decorative aerated pots for orchids. 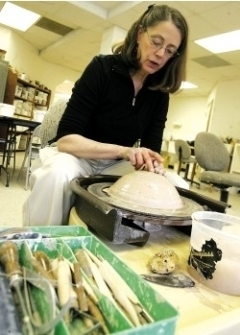 Owner of Lafayette Clayworks, in Branchville, Maurus-Sullivan has operated her business for 19 years, selling ceramic goods in her art gallery and teaching a variety of weekly pottery classes for adults and children. The Lafayette resident has been using a potter's wheel for 35 years, first learning the skill while studying art in college. "I was so attracted to it. You were making a work of art, but it had a basic function to it," she said, noting that many of her pieces can be used as serving dishes, cooking vessels or garden accessories. A former demonstration potter at Waterloo Village, Maurus-Sullivan said many visitors would ask where they could take lessons. After getting accustomed to demonstrating her art, she found it easy to pick up teaching in a private setting. According to Maurus-Sullivan, the process of making a ceramic piece can take three to four weeks, starting with "wedging" the clay by kneading all the air bubbles out, then forming it through various methods -- traditional "throwing" on a potter's wheel, or hand building by pinching the clay into a shape, rolling out slabs to be sealed together, or coiling clay into a mold. Shaped pieces are left a couple of days to dry until they are "leather hard," when they can be handled and trimmed for a more finished look. Once completely dry, the pottery is fired in a kiln, then typically coated with glaze and fired again. The pieces shrink quite a bit from beginning to end, and Maurus-Sullivan notes that you're never quite sure what the final product will look like until the glaze firing is complete. "I think for any potter, (the hardest part is) finding the right venue and how you're going to market the pots," said Maurus-Sullivan, noting that some pieces will sit on a shelf for years before being sold. "But if you're passionate, you just keep on making them. It's a fun way to make a living."